Male banjo connects a tubing at a 90° angle to a female threaded port. Male banjo is tightened on the top of the fitting by use of a flat wrench or a socket wrench. Accommodate metric tubing O.D ranging from 4mm to 16mm, inch tubing O.D ranging from 1/8" to 1/2". 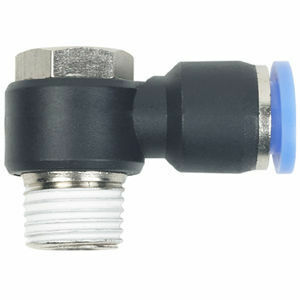 Male banjo is a common used part in the series of pneumatic fititngs and push in fittings.